Thomas Telford is renowned for the Caledonian Canal, running along the Great Glen fault linking eastern and western Scotland, an engineering challenge requiring 28 locks and costing over £900,000. But the Caledonian Canal is not the only Telford canal in the Highlands. Between 1815 and 1817 Telford designed and built a much smaller canal in Dingwall. Only slightly over a mile in length, and with no locks, it was designed to allow Dingwall, situated at the end of the Cromarty Firth, to become a port. Presumably before the canal small boats were able to undertake beach landings, and the canal was intended to allow bigger ships to access the county burgh. A section of the River Peffery was diverted to form the canal, at the cost of £4,365. It was not a huge success, netting only £100 a year for the investment, and by 1828 required costly repairs. The burgh attempted without success to pass over responsibility to the Commissioners for Highland Roads and Bridges. However the harbour was still effective for much of the 1800s, with at least two boats built and owned in the town engaged on coastal trading, and other boats are known to have used the harbour. The end of the use of the canal is less easy to determine. With the coming of the railway to Dingwall in the 1860s, and probably further silting up of the Firth, it may have been disused by the late 1800s. However, the harbour and course of the canal, are clearly labelled on the first edition Ordnance Survey map of the 1870s, and a harbour is still marked on maps of the early 1900s. Today the line of the canal remains clearly visible. Near the entrance to the Firth, the remains of a timber wharf still survive, though it is unclear if this dates to Telford’s time. 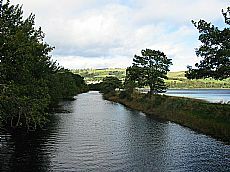 The Dingwall canal is said to be the most northerly surviving canal in Scotland.